The chronological ordering of feed is perhaps more preferred than the algorithmic feed, given that algorithmic feed makes it pretty difficult for users to know if they've seen all of the new updates from the people they follow. Instagram wants to solve this paradox with a new feature, called "You're All Caught Up" which will enable users to know when all new posts from a give period in time (for instance, in the past 48 hours) have been viewed. The feature is still in the works, though Instagram has confirmed that it is currently been tested among a limited number of users. Instagram's earlier switch to algorithmic feed, made most users unable to follow everything their friends had shared on the platform. And this resulted a lot of passive scrolling, as it was termed, meaning that surfed aimlessly in order not to miss out on anything. 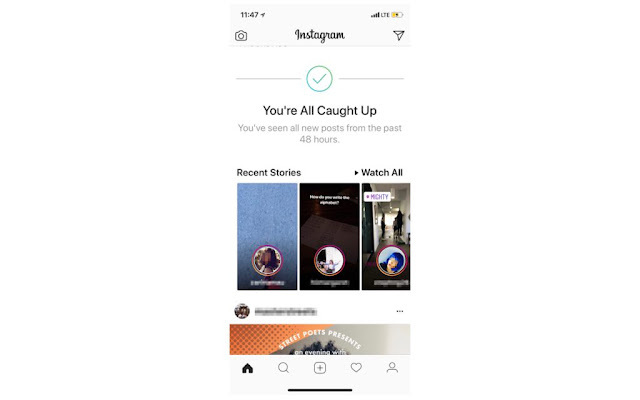 When the new feature goes live for all users, Instagram will display a mid-feed banner that says there’s nothing left to see for a user that has seen all of the content their friends have shared in the last 48 hours. It will read: “You’re all caught up, you’ve seen all new posts from the past 48 hours,” but how that will help to reduce the amount of time spent passively scrolling for missing update remains to be seen. Instagram is also rolling out a new “Usage Insights” feature to show users how much time they’ve spent in the app, which is coming on the heels of the clarion call for improved digital health for those addicted to social media. What Instagram's new feature, 'You're All Caught Up' is all about?